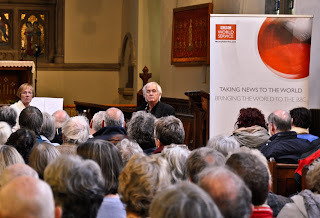 We had a fabulous afternoon on saturday - the church in Woodstock was packed with around 300 people and the BBC did a superbly professional job on the sound system so everyone heard perfectly. It was fascinating being part of a broadcast - Karen, the producer of the BBC World Book Club, told us what to expect and not to worry about fluffing our questions as the recording wasn't going out live, and Harriet Gilbertt, the interviewer, also put people at ease. 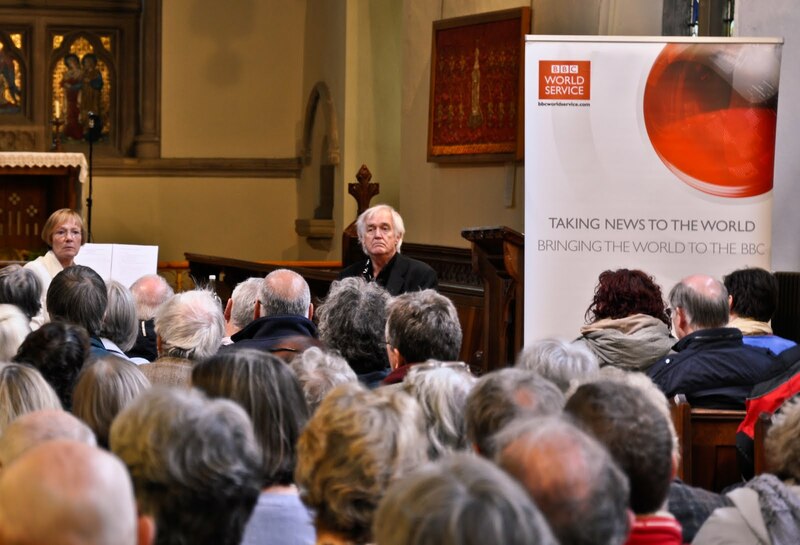 And then we were off - Harriet's voice changed immediately into a BBC announcer's voice, and Henning Mankell began unexpectedly with a short speech about voice amplification, questioning the need for microphones in a church where people have spoken and been heard for hundreds of years unaided. The amplification was, in this instance, necessary as there was a soundman, Tim, in the vestry, recording everything for a broadcast on the BBC World Service on July 2nd at 11 am. So if you were not able to be there on saturday or would like to hear it all again and find out the differences between a live and an edited discussion, you can listen to the radio on July 2nd. The top picture shows Harriet Gilbertt introducing Henning Mankell; the one below shows the aftermath of the talk, me on the left and Henning Mankell in the middle, signing books. On Saturday May 28 at 1.30 we are holding a very unusual event: Henning Mankell, author of the Wallander series of detective novels, will be discussing Faceless Killers for the BBC World Book Club, introduced by Harriet Gilbertt. He will also be signing copies of his books afterwards, including the final Wallender mystery The Troubled Man. This is a very rare chance to meet Henning Mankell as he spends most of his time in Maputo and Sweden. The discussion will take place at St Mary Magdalene Church in Woodstock. Tickets are £4 and must be booked in advance from The Woodstock Bookshop: 01993 812760. We will not admit people unless they have booked a place in advance. Henning Mankell will be interviewed by Harriet Gilbertt who runs the BBC World Service Book Club. As this is a book group discussion, one book will be discussed - Faceless Killers. When we first sent out publicity for this event the book to be discussed was announced as Before the Frost - please note that it has been changed to Faceless Killers.